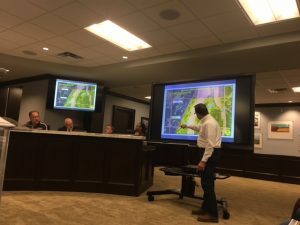 “I beg you please don’t do this,” was part of the plea made by Mike Vorel to the Oklahoma County Planning Commission Thursday as the “recommending” board considered a special use and zoning change application from Dolese for a temporary concrete plant. Vorel was one of several neighbors who responded to a public hearing on Dolese’s request to build the batch plant on the northeast corner of Memorial Road and Triple X to service its contracts for construction of the Eastern Oklahoma County Turnpike and other jobs resulting from the new toll road. 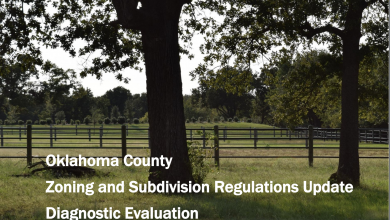 The land is in the unincorporated areas of Oklahoma County, between Luther and Jones. Neighbor Bill Weger also spoke to the group that makes recommendations to the full county commission. “The idea of a .. zone change is abhorrent to me,” said Weger who said the plant would devalue his property and cause air quality issues from the industrial activity that would affect his elderly parents and grandchildren. Planning Commission Chair Irene Martin clarified that the zoning change from rural to industrial would remain with the land owner, after the special permit for the concrete plant was fulfilled. Dolese was asking for a three-year permit with an option for three more years. Mike Vorel, standing, once served on the Oklahoma County Planning Commission and was among the neighbors protesting the concrete plant. Vorel mentioned that this issue had brought him back to the Planning Commission. He is a former county planning commissioner himself who represented Eastern Oklahoma County. He was part of the team that developed a new Oklahoma County Master Plan in 2007. “When we wrote our Master Plan, we kept the rural parts as rural as possible,” he said. He also advised the commission that approving this zoning change and special permit would make it easier to approve the next one. Neighbor Laura Blaylock also spoke against the plant and pointed out truck traffic will damage Memorial Road. 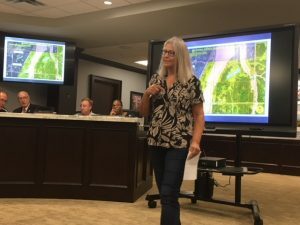 Dolese Representatives answered questions posed by commission members and neighbors that ranged from whether the company sought other sites for their plant, how long they will stay in the area, how much water would be used, whether it’s in a flood plain, the noise level and hours of operation. Dolese said they looked at four other spots but none worked as well as the proposed land lease from the Love Family Trust. They said that having the concrete closer to the work is advantageous to the company and the client and this site is a mile and a half from the construction. Looking south from Memorial Road to the new turnpike. 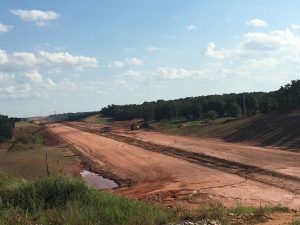 Several residents asked why the plant couldn’t be included on acquired turnpike land, but Dolese representatives said OTA doesn’t allow that, and the concrete company would be subcontracting for others who are building the 21-mile road that connects the Turner Turnpike to I-40. “We fought the turnpike and it was very heart-wrenching. This is pouring salt in the wound. This area was meant to be agricultural,” said Karly McEntire who lives close to the site but wasn’t given notice about it until the last minute. The 2007 Master Plan that Vorel helped compile speaks to the County purposefully limiting industrial use. 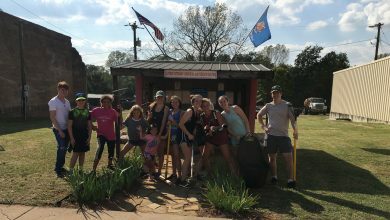 Industrial activity is one of the most underrepresented land use activities in the unincorporated areas of Oklahoma County. This is due, in part, to the historic rural nature of the area and the lack of public water and sanitary sewer in the unincorporated areas. 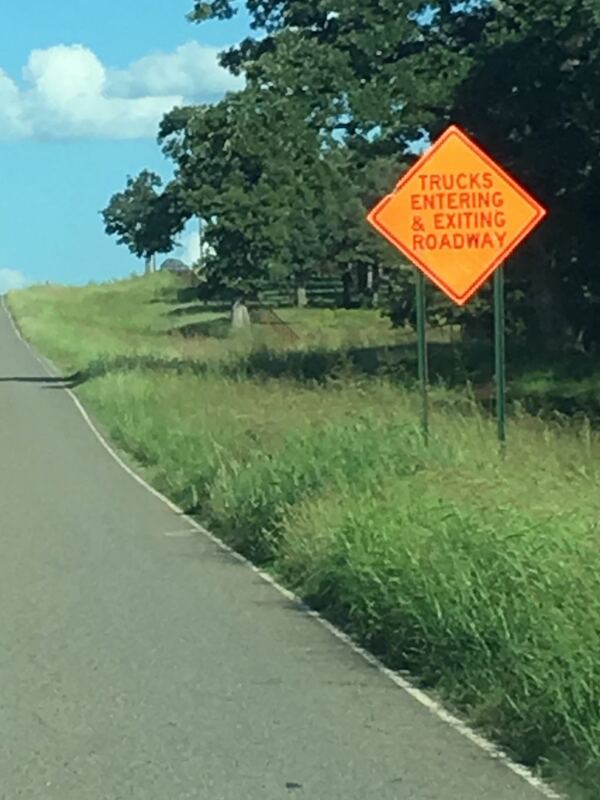 Areas of rugged terrain and limited transportation access for shipment of raw materials and products are not suitable industrial sites.” from the 2007 Oklahoma County Master Plan. After all of the questions had been asked and answered, Chairperson Martin called for a motion. After a pause, Commissioner David Martin moved to deny Dolese’s request. The vote supporting the motion was four to two. Tom Dupuis from Dolese presented his company’s plan for the batch plant. County Commissioner Ray Vaughn abstained from the vote as did Planning Commission volunteer Charles DeFuria who lives in this area. 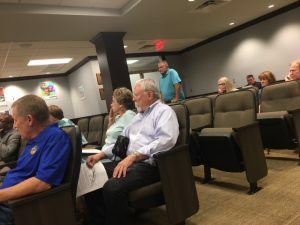 The Planning Commission will send its recommendation to Vaughn and the rest of the three-member elected County Commission for their final vote on the matter. Dolese officials did not have any comments about the denial, and the neighbors said they were surprised the issue went in their favor, and were cautiously optimistic about the next step in the process. That’s a small win for our community. Hopefully the next step in the process is fair as well.